Asset Champion Marcy Joseph from the Friends of the St. Louis Park Library shared ways this group supports asset building through library programs. Besides volunteering, the Friends of the Library provided nearly $3,000 for youth programming in 2008. The Friends support youth activities during the school year and the very busy summer months. They cover expenses for programs, entertainers, books and giveaways and refreshments. One of the big events the Friends support is Dr. Seuss’ birthday party. This year the party is on Monday, March 2 from 4–5 p.m. Designed for preschoolers and early elementary school aged children, the party includes the reading of Dr. Seuss books, dancing and refreshments. Another event is a youth art open house and reception scheduled for Saturday, March 14, 9:30 – 11 a.m. The open house features art created by students from Susan Lindgren Intermediate Center and Park Spanish Immersion School. Stop by for the open house or view the art during library hours until mid-April. Working in coordination with Ellen George, the St. Louis Park High School’s media specialist, the public library has teen volunteers who work at the book sales including set up and cleans up. Book sales are a way the Friends generate funds to support all this great programming. So when you see the library is having a book sale, you can feel good buying a book not only to further your involvement in asset #25 “Reading for Pleasure,’” but also that your purchase supports asset #25 for St. Louis Park children and teens. 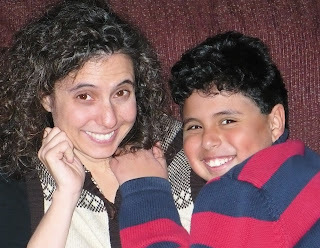 Marcy is pictured here with her 10-year-old son Noah. ← Fill Empty Bowls on March 5!